Indego bikeshare bikes near the Comcast Center in Center City. 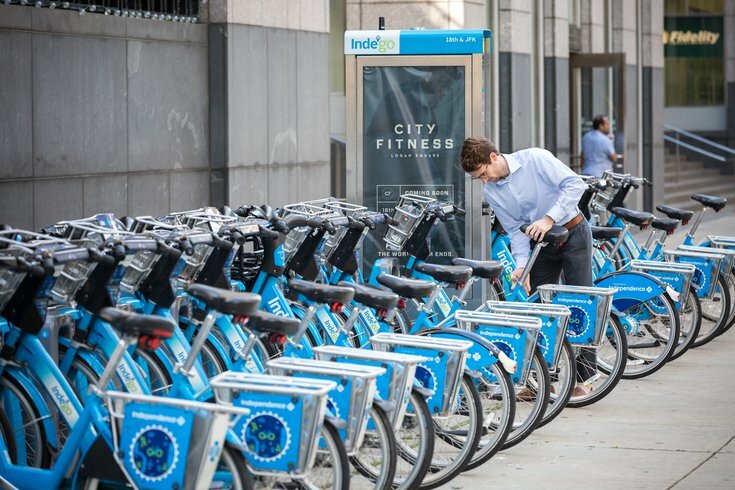 Indego riders who purchase monthly passes to bike in Philadelphia will have to shell out a few more dollars each month beginning this spring. The monthly Indego30 pass will increase to $17 per month on April 12, a $2 bump above the current rate. But riders willing to pay $156 for an annual pass, dubbed Indego365, will pay at a rate equivalent to $13 per month. Indego365 ACCESS passes will sell for $48 per year for Pennsylvania ACCESS cardholders. Additionally, Indego will lower the minimum age requirement from 16 to 14. The changes are part of several pricing alterations announced Monday to spur continued grow of the city's bike share program, which debuted in 2015. Indego also is adding a Day Pass that runs $10 per day for unlimited 30-minute rides. Longer rides will be subjected to an additional $4 per 30 minutes. The new Day Pass replaces Indego's Single Ride option, which allowed users to pay $4 per 30 minutes. The monthly Indego30 ACCESS pass will remain at $5 per month. Flex Pass pricing also remains unchanged.